Well, how could you not be tempted by the title ‘Honey Cake’? 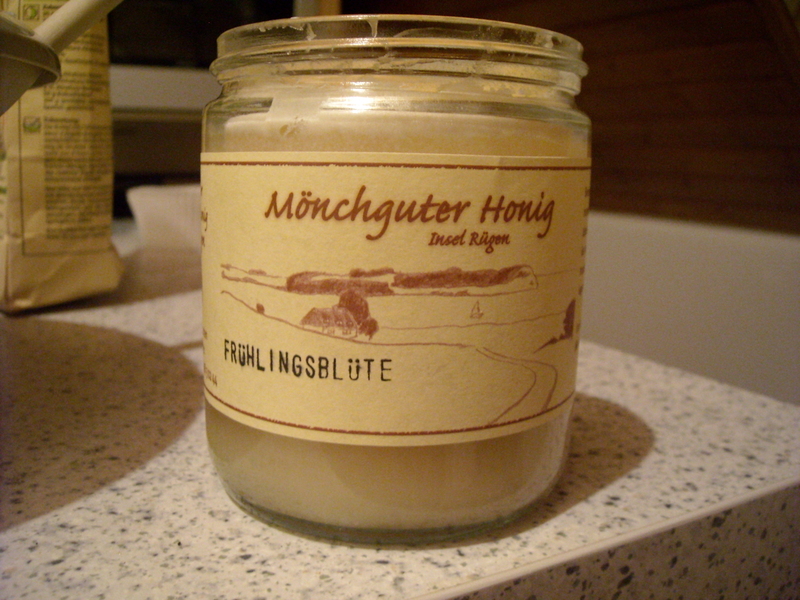 Recently, a friend of ours gave us a jar of absolutely delicious honey from a friend of hers, who produces honey in the north of Germany. I love honey, and this recipe offered the perfect opportunity to go crazy with it. INGREDIENTS – 1/2 breakfast-cupful of sugar, 1 breakfast-cupful of rich sour cream, 2 breakfast-cupfuls of flour, 1/2 teaspoonful of carbonate of soda, honey to taste. 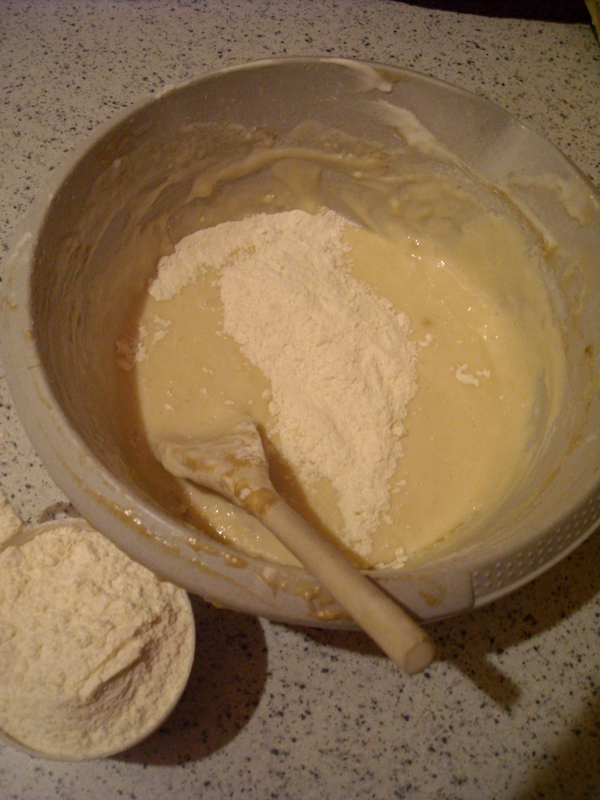 Mode.—Mix the sugar and cream together; dredge in the flour, with as much honey as will flavour the mixture nicely; stir it well, that all the ingredients may be thoroughly mixed; add the carbonate of soda, and beat the cake well for another 5 minutes; put it into a buttered tin, bake it from 1/2 to 3/4 hour, and let it be eaten warm. 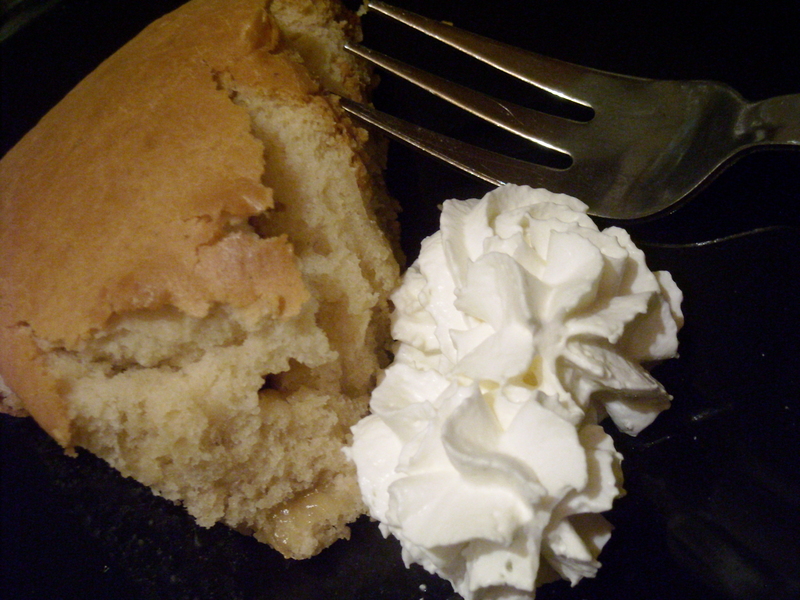 I’ve never made a cake with sour cream before – I felt a little bit naughty, and adventurous, at the same time. Isabella Beeton is rather vague about how much honey to add (“to taste”, whatever that’s really supposed to mean when you’re cooking something for the first time), so I eventually opted for 4 round tablespoons full. After all, I decided, it’s honey cake, so why skimp on the honey? The final result is very, very nice (my boyfriend LOVED this cake – he even went back for seconds, which is almost unheard of in this household). He did make a small contribution to it though. “You know what would make this even better?” he grinned gleefully. Oh no. It’s his perpetual rhetorical question at the moment, so I knew exactly what was coming. “Go on, tell me,” I groaned. And before I had a chance to say a word, he dashed into the kitchen and grabbed the tin of whipped cream that I had reluctantly purchased a few days before for a dinner party. With a hearty squirt into his mouth, he then proceeded to add a (hefty) dollop to each plate, grinning all the while like a manic Cheshire Cat. “Mmmm mmmm,” he greedily gulped. And, despite the fact that I’ll never admit this to him – he’s possibly, probably, right. It did make a delicious difference. INGREDIENTS – 1/2 breakfast-cupful of sugar, 1 breakfast-cupful of rich sour cream, 2 breakfast-cupfuls of flour, 1/2 teaspoonful of carbonate of soda, honey to taste.Mode.—Mix the sugar and cream together; dredge in the flour, with as much honey as will flavour the mixture nicely; stir it well, that all the ingredients may be thoroughly mixed; add the carbonate of soda, and beat the cake well for another 5 minutes; put it into a buttered tin, bake it from 1/2 to 3/4 hour, and let it be eaten warm. This entry was posted on February 11, 2010 at 11:45 pm and is filed under food. You can follow any responses to this entry through the RSS 2.0 feed. You can leave a response, or trackback from your own site.